I have given in. For the last 10 days I have fought The Cold. Finally I accept it. It’s not like I haven’t tried my best in this battle – I have thrown everything at it. 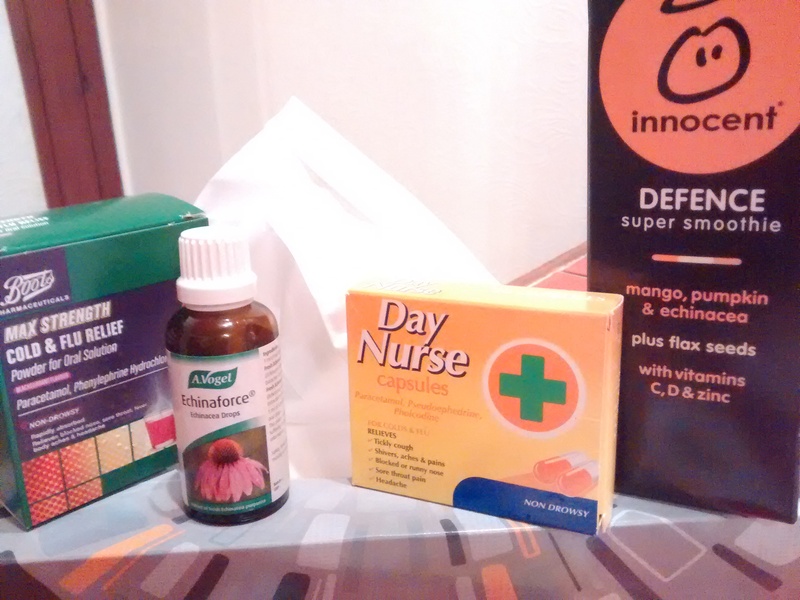 Hot lemon drinks, Echinacea drops, day nurse, night nurse, vitamins, even a bottle of ‘defence’ Innocent smoothie. But it’s not shifted. I’ve felt so defeated and it’s really got me down. The last two weekends the weather has been great for cycling. A few bits of lingering snow but apart from that clear, blue skies and cool but manageable weather. I have watched bikes zoom past my windows, and people out for runs. It has got me down and the people who know me have had to bear the brunt of my misery. Finally, last night I decided I have to accept this. I will get better and I will soon be back on my bike and training. I’ve signed up to do this in the summer with some friends. It will be something fun (if not a bit muddy!) to look forward to. Sometimes the tough days just need to be accepted. Chin up, Suz! You’ll be fighting fit again in no time! I’ll be in touch tomorrow – your training plan is finished! A lingering cold is the dumbest invention of all time…hope you are feeling better. That mud run looks like a blast! Rest is the ultimate cure..
Last weekend, I tried garlanding my Country’s northern capital region, in a feat to salute soldiers a day beore Republic day..then I attended republic day from 05:00am..the queue..the program..all i was but standing..and it rained too..it was only by evening 18:00 that I was back..and I caught up severe temperatue..and series of coughs..which lasted for entire week.. Yet I attended my office..each day..waiting for next weekend..and believe me, as soon as sunday came..the whole day I did nothing but rest, and I was free from the cough and fever.. I tried no tablets, but rest.